In order to use the Costlocker API, it’s necessary to generate a token that serves as a security measure and a key to your data. The API token can only be generated by the account Owner, i.e. the person who created the account in Costlocker. Start by clicking your name in the upper right corner of the screen and select the Settings option. Next, select the API tab. You can generate your token on this page. Note: Whoever has access to this token can access your sensitive business data, such as salaries and profits. 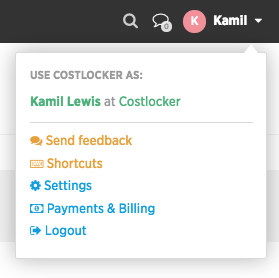 Costlocker API is well-documented and more information can be found at our apiary.